Helsinki’s synagogue. Photo by Jono David. While superficial similarities are easy to explain, there are affinities between the Jewish state and Finland that go beyond coincidence. Though not immune to the kind of anti-Israel rhetoric common in much of Europe, Finland seems to have a hardier strain of pro-Israel sentiment than most countries on the continent. One factor in this attitude is a vein of pro-Jewish feeling among Finnish Christians. Another is 20th-century history, during which Finland fought hard to achieve and maintain its independence from a neighbor many times its size. And Finnish Prime Minister Jyrki Katainen recently cited Israel’s high-tech success as a potential model for his country to emulate. One key to Finnish friendship toward Israel and admiration of its own Jewish community is military. There are few diaspora nations where Jews established a high military profile. Among the exceptions, only in Finland did Jewish residence begin with military service. Under a century of Russian rule (1809-1917), the Grand Duchy of Finland was off-limits to Jewish settlement—with the exception of Cantonists, the term applied to Jews in the czar’s army. In 1858, Czar Alexander II proclaimed that Jews finishing their service in Finland could remain. Finland had considerable autonomy within the Russian Empire and in the beginning local authorities imposed residential and occupational restrictions on its Jewish subjects. Many Jews supported themselves by dealing in old clothes, businesses that eventually became the foundation of Finland’s textile industry. Several Jewish merchants set up shop in the city’s Narynka Market, a cluster of Russian stalls that, after Finnish independence, became a predominantly Jewish market. The first synagogue in civilian Helsinki opened in 1870 in the Langen Villa, in the city’s Siltasaari section. For the next 45 years, there were short-lived Jewish sanctuaries in at least three other locations, including the Atheneum Art Museum, which had a big hall suitable for the High Holy Days. Over time, conditions for Jews were eased. In 1906—when there were still pogroms in other corners of the Russian Empire—the Helsinki community dedicated its first permanent home on Malminkatu Street, on a plot of land donated by the city. That same year, because limitations on meetings and free speech were looser in Finland than in Russia proper, Russian Zionists held their convention in Helsinki. The two events raised the Jewish community’s profile and had a catalytic effect on cultural life. That same year saw the foundation of a Jewish literary and theater society and a Jewish sports club, which today is regarded as the oldest continuous Maccabi organization in Europe. In 1909, the Finnish Parliament abolished all restrictions on Jews. Russia never ratified the law, so Jews did not earn full civil rights until Finnish independence eight years later. Taking advantage of the chaos that followed the Russian revolution, Finnish nationalists proclaimed independence in December 1917. World War II was especially complicated for Finland and its Jews. By Finnish reckoning, the country fought not one but three wars between 1939 and 1945. In the first, the Soviet Union attacked. Finnish forces, under the command of Marshal (and later President) Carl Gustaf Mannerheim, outmaneuvered the superior Soviet numbers and held off a winter assault. With the German conquest of Denmark and Norway, the chance of any relief from the Allies evaporated. Finland faced the prospect of a renewed Russian attack that could snuff out their independence, Nazi occupation or some kind of cooperation with Germany. They chose the third option. German troops were allowed on Finnish territory and the two nations became cobelligerents against the Soviets. The memorial to Helsinki’s Jewish refugees. Photo by Jono David. Mannerheim knew that Finland had to be on the “right” side of the war by the time it ended. In August 1944, he became president and in September he signed a separate peace with the Allies, ceding 10 percent of Finnish territory to the Soviet Union. The accord meant war with Germany, which still had troops in the country. In their retreat, the Germans burned every city and town in Lapland. In November 1944, while the hostilities with German troops continued, Mannerheim visited the Helsinki synagogue for a memorial service honoring the 23 Finnish Jewish soldiers who died during the war. There was one stain on the nation’s history during the war. In 1942, the Germans asked for the extradition of a large number of German, Russian and Baltic refugees in Finland. Twenty-seven were handed over—including eight Jews who were shipped to concentration camps. News of the deportations caused an uproar in Finland and the government refused further cooperation. The director of the Finnish Security Police, Arno Anthoni, was held responsible for the deportations. After the war he was tried and reprimanded by the Supreme Court, but not jailed. In 1948, 29 Finnish Jews went to Israel to fight in the War of Independence. During the next two decades, some 200 more immigrated to the Jewish state. Finland’s Jewish population stands at about 1,800, of whom 1,500 live in Helsinki. There are smaller communities in Turku (which has its own synagogue) and Tampere. About 70 percent of the country’s Jews are native born, many descended from the Cantonists who chose to remain in Finland in the 19th century. More recent arrivals are from Russia, Israel and the United States. The Jewish Community of Helsinki is at Malminkatu 26 (011-3589-586-03110; www.jchelsinki.fi), a 10-minute walk from the center of the city. The synagogue’s ritual is Modern Orthodox. Siddurim are in Hebrew and Finnish: There is likely not another language with so few Jewish speakers that can make a claim to have prayer books in that native tongue. In 2013, the community welcomed Simon Livson, its first Finnish-speaking rabbi. Shabbat morning services begin at 9 A.M. throughout the year. Because of the late sunset, Friday evening services during the summer months begin at 7:30 P.M. and, according local tradition, are completed at home. Helsinki is a city etched by cobblestones and tram tracks and surrounded on three sides by the Baltic Sea. It was little more than a village until 1748, when construction began on the Suomenlinna Fortress just offshore. Growth accelerated after 1812, when Czar Alexander I made it the capital of Finland. In the 20th century, Helsinki became a showcase for Modernist architecture, but much of its charm is of 19th-century vintage, when many of the architects who gave shape to the city, with stone buildings influenced by neoclassical and Palladian styles, also worked in St. Petersburg. This shared heritage explains why Helsinki has often served as a stand-in for its Russian neighbor in Hollywood films (Doctor Zhivago, Gorky Park, White Nights). At Malminkatu 26, facing the street, is the synagogue, a yellow-stone building with tall arched windows topped by a Byzantine-style silver dome. Behind and connected to the original building is a community center added in 1961. The complex also houses the community’s mikve, school—for students aged 3 to 15—and various communal organizations. 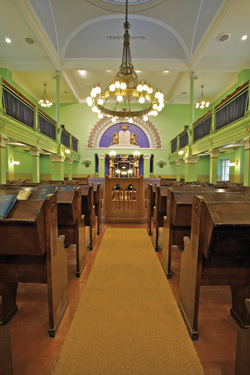 The Jugendstil-influenced sanctuary has pastel green walls, a central wooden bima and high-backed wooden benches; the community’s history is written into many of the sanctuary’s fixtures. One of the 14 Torahs in the Ark was rescued by a Jewish soldier in the Crimean War. The crown above the Ark is from an old Swedish warship (God’s name was mounted onto the artifact). There are two menoras on the sanctuary’s front wall with Stars of David hanging from the branches—each star inscribed with the name of a Jewish soldier who died defending Finland. Down the hall from the main sanctuary is a small chapel that includes a handmade brass plate from the Jewish prayer room in the Suomenlinna Fortress. The hallway also has reminders of the community’s most illustrious visitor. Photos of Mannerheim are on the wall, next to a glass case containing the wreath he brought in memory of fallen Jewish soldiers. 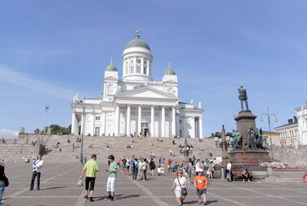 Any Jewish itinerary in the Finnish capital should include a visit to the Helsinki Cathedral, which shares Senate Square with the prime minister’s office and the University of Helsinki. The cathedral (358-9-2340-6120), noted for its five green cupolas and white Corinthian columns, is the square’s most imposing landmark. Though its main entrance faces south, it is above the western portal that you will find the name of God chiseled in Hebrew. Such inscriptions are somewhat common in Lutheran churches in Finland. To get a better sense of Finnish history, one of the best places to visit is the Mannerheim Museum. Located in the city’s seaside Kaivopuisto section, the white, two-story villa was Mannerheim’s primary residence from 1924 until his death in 1951. The furnishings tell the story of his life, his decades of service in the Russian army, his mission as a spy, his love of books and languages and his military and political leadership of Finland. Perhaps the most striking single feature of the house is his austere bedroom—and the military cot he slept on. The museum is at Kalliolinnantie 14 (358-9-635-443; www.mannerheim-museo.fi). Living conditions for Swedish soldiers were grim. They slept in the cold, damp casements of the fort’s walls and lived on porridge. More perished in the building of the fortress than would ever die defending it. By the time the first Jewish soldiers arrived under Russian command, there were barracks at the fort. Suomenlinna, named a Unesco World Heritage Site in 1991, has six museums. Not to be missed are the eponymous Suomenlinna Museum, which reviews the history of the fortress and its construction, and the Ehrensvärd Museum in the residence of the fort’s architect. Be sure to stop at the visitor center and sign up for a guided tour of the fortress. In addition to the historic attractions, the Suomenlinna complex has nine restaurants and cafés and many shops. To reach Suomenlinna, take one of the city ferries from the eastern end of Market Square. Not far from Market Square, facing the terminal for the larger cross-Baltic ferries, is Tähtitorninmäki, a small park. In 2000, the Finnish government dedicated a memorial to the Jewish refugees surrendered to Germany during the war. 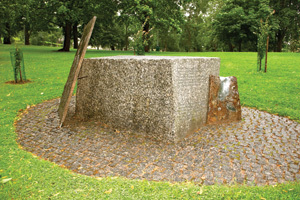 The monument consists of a rectangular stone, bearing the names of the eight deportees (seven of whom died), set on top of a cobblestone circle. The memorial is within sight of the spot from which the refugees were deported in 1942. Le Chaim! : Images from the History of the Jews in Finland, published by the community, is more than its cover proclaims; accompanying the photographic history are detailed chapters (in English as well as Finnish) that provide a comprehensive overview. The book is for sale at the community center, as is the Finnish-Hebrew siddur. Carl Gustaf Mannerheim has been the subject of many biographies; one especially good one is Mannerheim: President, Soldier, Spy (Haus Publishing) by the British author Jonathan Clements. For a unique look at Mannerheim’s relationship with the Jewish community, see Rachel Bayvel’s summer 2006 article in the London-based Jewish Quarterly. Arguably the best-known Jewish personality in Finland is Police Inspector Ariel Kafka, the central character in a series by Harri Nykänen, a crime novelist and former journalist. The first in the series, Nights of Awe (Bitter Lemon Press), is the one most focused on the Jewish community. Once dominant in the textile industry, today Jews can be found across the professional spectrum. Many have become prominent in Finnish society and abroad. Max Jacobson served as Finland’s ambassador to the United Nations; he was a candidate for United Nations secretary general in 1981, but was defeated by Austria’s Kurt Waldheim. Historian Max Dimont, author of Jews, God and History, was born and raised in Helsinki. Other personalities include Ben Zyskowicz, the first Jewish member of the Finnish parliament; the abstract artist Sam Vanni, well represented in the collection of the Atheneum Art Museum; pop singer Marion Rung, who twice represented Finland in the Eurovision Song Contest; and theater and film director Mauritz Stiller, who discovered Greta Garbo. One of the best deals for visitors is the Helsinki card, which provides access to public transportation (including ferries), entry to major museums and discounts at many restaurants and shops. Cards can be purchased at several hotels as well as at the Helsinki Tourist Center at Pohjoisesplanadi 19 and online at www.helsinkiexpert.com. Finland is famous for design, and some of its most popular items for tourists shopping for souvenirs are wood and glass pieces as well as jewelry, most with the same smooth, contemporary lines found in Finnish architecture. Next door to the synagogue, at Malminkatu 24, is Zaafran & Co., Finland’s only kosher deli, café and market (358-442-564-032, www.zaafran.fi). Zaafran serves cruise ships docked in Helsinki and, with advance notice, can also send kosher meals to nearby hotels. Karelian pies are a popular national comfort food: The “pies” are essentially rye-crust pastries with a potato or rice filling. And salmon appears on menus everywhere, notably salmon soup and graavilohi, similar to gravlax. Graavilohi is sometimes used to prepare Finnish sushi, with potato replacing the rice. Helsinki has many fine hotels, but it’s hard to imagine a better base from which to see general and Jewish sights than the Radisson Blu Royal (www.radissonblu.com/royalhotel-helsin ki), at Runeberginkatu 2, right across the street from the synagogue—a shorter walk than the first Jewish soldiers had from their barracks to their fortress prayer room. This is fascinating. In a recent DNA analysis, I discovered I have some Finnish ancestry. This explains how it is possible, although not exactly when it occurred! Most likely one of the cantonists infiltrated my Russian Jewish forebears, who arrived in the U.S. in the early 1900s. How his DNA got into my bloodline is a mystery, but of interest nonetheless. THE BEST WAY TO TO VISIT THE JEWISH COMMUNITY ,THE SYNAGOGUE AND TO HEAR THE INCREDIBLE UNIQUE HISTORY OF THE JEWS OF FINLAND IS TO TAKE THE JEWISH HERITAGE TOUR OF HELSINKI,WITCH INCLUDES ALSO VISITS TO ALL THE HIGHLIGHTS OF THE CITY.